Running water can be difficult for some plants, but Acorus gramineus loves it. 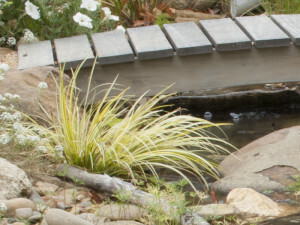 It thrives in ornamental ponds and streams here in Melbourne. It needs no fertiliser, and grows in sun and shade. I have Acorus growing in my own pond, as a marginal plant, and between rocks in the fast-running stream that feeds the pond. It is also growing very well in my pondless stream, in full sun. 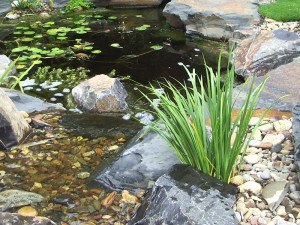 In all cases, I divided the plants before planting them into pebbles, directly into the water. Its common name is ‘Japanese Sweet Flag’ and, as you would guess, it is a Japanese native. It’s evergreen, with strappy, deep green leaves similar to Liriope muscari (Turf lily), and Ophiopogon japonicus (Mondo grass). It grows 20-30cm tall, and spreads slowly. The flowers are plain, but you would want Acorus in your pond for its foliage alone. Acorus gramineus ‘Ogon’ has yellow and green variegated leaves. It stands out with its foliage colour against solid green plants, and is great for foliage colour contrasts. Acorus gramineus ‘Variegated’ has white and green variegated leaves. It is more subtle than ‘Ogon’. While I prefer the solid green of the straight species, I also like the striking colour of ‘Ogon’.